So online dating is for the young and fancy free? Think again. 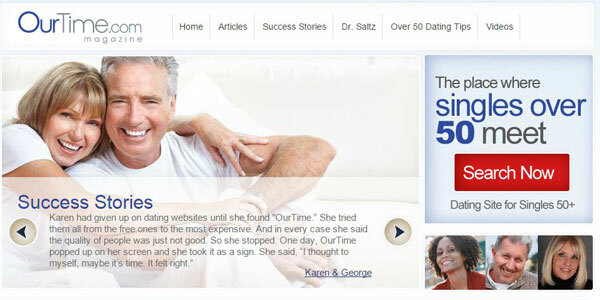 OurTime.com is proof that singles over 50 can find love and companionship online. More than 1.4 million visitors each month can’t be wrong. Experienced online daters will love adventurous features such as the audio and video greetings. Novices will feel right at home, too, with access to simple no-nonsense tools such as SMS messaging. Just like any other quality online dating platform, OurTime boasts a healthy range of features. Getting in touch with other users is left to your own personal preference – Choose from private message, instant chat, a suggestive ‘flirt’ plus audio, video and classic SMS messaging. As any OurTime.com review will tell you, one of the great advantages to this site is the ability to stay in your own comfort zone, wherever that may be. Users will also enjoy the online magazine, which provides overall dating advice, plus specific tips on how to make your profile stand out and other useful topics. And if you really want to give your profile a boost, then invest in some tokens, which will hand you greater visibility for a limited amount of time. It took this OurTime dating site reviewer little more than several minutes to complete the entire sign up process and start browsing. The process is incredibly straightforward. All you need to do is answer some basic questions about yourself with some rudimentary information. You will be asked to submit a valid e-mail address and password, plus information on your education, physical features and more. All of this takes just a few minutes. However, if you want a meaningful dating experience, then it is well worth providing substantial optional information. You can upload up to 30 photos and you are well advised to complete the “About You” and “Just like to add…” sections which provide an excellent opportunity to really convey what you are looking for. You can complete your profile at any time and in doing so, submit more information on questions such as punctuality, opinions on live theater, etc. All of these details will help the site match you effectively. You can use OurTime.com without any worries. Safety and security is taken seriously. For a start, there are a number of tips for safe online and offline dating. And if you really find another user bothersome or indeed threatening, then you can either block them yourself or report them to site administrators. You are welcome to sign up as a free member and if you aren’t sure about online dating, this is perhaps a good way to test the water. You can create a profile and browse. However, if you want to communicate with other members, you will need to pay. This will set you back $29.96 for just a single month. 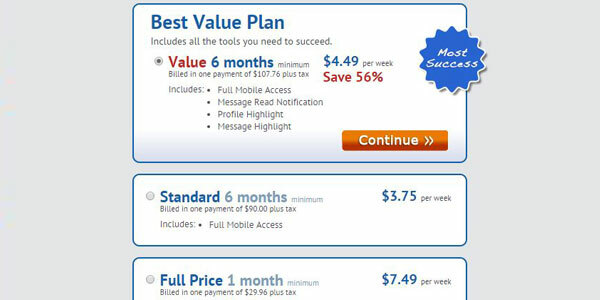 However, if you sign up for 6 months as a regular user, it will cost just $15 monthly. The Value 6-month deal is slightly more expensive, at a total cost of $107.76. However, you will have access to special features such as notification when a message has been read. There is quite simply nothing complicated about using OurTime. The sign up is brief and to the point. Once you log in to your personal dashboard, you will find things just as straightforward. Everything you need is just a click away, making the site simple for even the most inexperienced user to navigate. The tabs along the top of the page give you direct access to your inbox, search function and suggested potential matches. Meanwhile, you will find useful lists along the left hand side, so that you can glance at who liked your photo, who you ‘flirted’ with and other practical information. Meanwhile, there is a user-friendly mobile version of the site, too, so you need never miss any of the action. You can let the site do the work. The automatic OurTime search algorithm will match you with five suitable users on a daily basis, based on the personal information you have submitted. You can use the “I’m Interested” tool to indicate whether these suggestions have caught your eye or not. If you prefer to take matters into your own hand, then you can conduct a manual search. The Standard Search allows you to build a general picture of the possibilities, searching via broad categories such as age and location. Meanwhile, the Advanced Search lets you hone in on the criteria important to you, including education, physical features and even Zodiac sign! 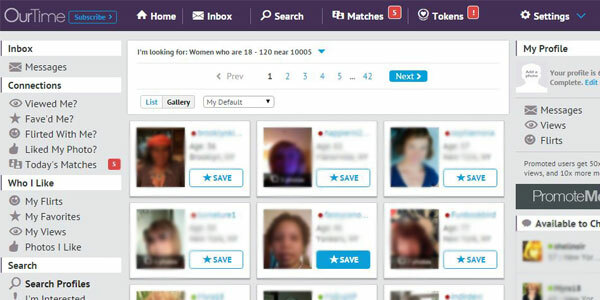 Online dating has never been so simple or effective for mature users. This is a demographic which is often looking for something different from the traditionally younger online dating crowd. And this OurTime.com review can only report a great job in filling this gap. There are no frills to the site, but it doesn’t need them. This is a clean, simple to use platform with all the features you could want to find the person you’re looking for. Thanks to OurTime, life really can begin at 50!